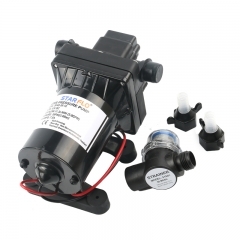 360LPH 24V DC Surface Solar Water Pump System For Irrigation STARFLO's 9300 series solar bore pumps offers a solution to your remote water needs. It's rugged, durable and built to last. 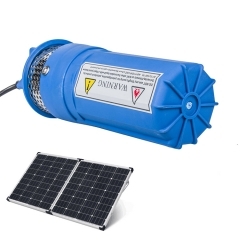 This solar submersible water pump delivers a steady 1.0 GPM operation at 100 PSI maximum at 230 feet (70.1 m) It incorporates a unique waterblocked cable connector that is impervious to water leakage and condensation problems preventing waterwicking. 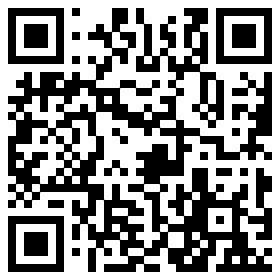 Great for applications in livestock watering, irrigation, ponds, islands, remote homes and cabins. FEATURES Long -life 24 VDC operation For 4" wells or larger Quick disconnect with "Watertite-Gland" Design Pat Pend Corrosion-proof housing with stainless-steel fasteners Runs dry without damage 50 mesh stainless steel inlet screen TECHNICAL DATA SOLAR WATER PUMP DRAWING Sample order is very welcome to have a test, if need more technical specification, pls send email to us ! 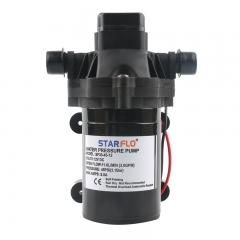 12V DC Submersible Irrigation Water Pump The STARFLO solar water pumps 6LPM are suitable for 4" well or larger, with quick disconnect with " Watertight-Gland" Design Pat Pend. 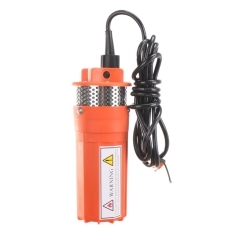 The 12 volt submersible water pump with corrosion-proof housing with stainless-steel fastener, also it can run dry without damage. 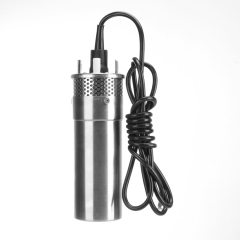 The solar powered submersible pump provides the solution to your remote water pumping needs. This pump is rugged.durable and builtto last. This pump delivers a steady 162GPH(600LPH) at its maximum depth of 230 feet (70m) when supplied with 24VDC. Its unique water-tight power connector stops water wicking and prevents potential condensation problems. The best for livestock watering. irrigation, ponderation, remote homes and cabins TECHNICAL DATA SOLAR PUMP DRAWING Sample order is very welcome to have a test, if need more technical specification, pls send email to us ! 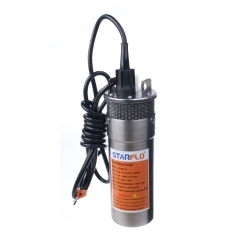 24V DC Solar Powered Water Transfer Pump 230ft Farm Ranch Household The STARFLO SF2440-30 solar powered submersible pump can offer a solution to your remote water needs. It designed to be used with solar panels and 24v battery systems. 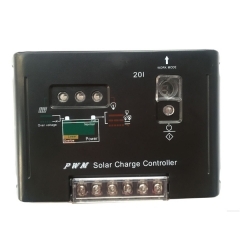 It means Easy Hookup to most any existing solar panels or wind generator systems. It is rugged, durable and built to last, it delivers a steady 360 LPH at its maximum depth of 230 feet (70M) when supplied with 24 VDC. 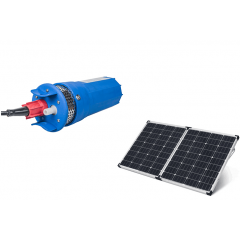 The solar submersible well pumps can be used with or without components such as voltage controllers. 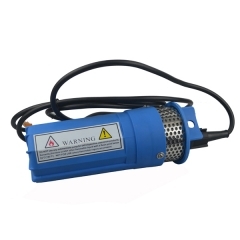 This pump can be used for livestock watering, irrigation, ponds, remote homes and cabins. Unique water blocked cable connector is impervious to water leakage and condensation problems preventing water-wicking. FEATURES Long -life 12-24 VDC operation For 4" wells or larger Lifts water from wells up to 230' deep Can pump up to 111 gallons per hour Quick disconnect with "Watertite-Gland" Design Pat Pend Corrosion-proof housing with stainless-steel fasteners Runs dry without damage 50 mesh stainless steel inlet screen to keep debris out Motor is sealed for long life and durability State of the art solid diaphragm TECHNICAL DATA Sample order is very welcome to have a test, if need more technical specification, pls send email to us ! DC Powered Solar Water Pump For Agriculture MORE SOLAR WATER PUMP FEATURES Long -life 24 VDC operation For 4" wells or larger Quick disconnect with "Watertite-Gland" Design Pat Pend Corrosion-proof housing with stainless-steel fasteners Runs dry without damage 50 mesh stainless steel inlet screen State of the art solid diaphragm SOLAR WATER PUMP DESCRIPTION STARFLO SF series solar water pump provide the solution to your remote water pumping needs. This pump is rugged, durable and built to last. 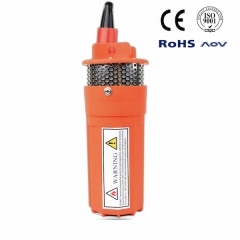 It delivers a steady 112 GPH (422 LPH) at its maximum depth of 230 feet (70M) when supplied with 24 VDC. Its unique water-tight power connector stops water wicking and prevents potential condensation problems. Great for livestock watering, irrigation, pond aeration, remote homes and cabins. PUMP Model Number SF1240-30 Pump Design Positive Displacement 3 Chamber Diaphragm Pump Motor Permanent Magnet, Thermally Protected Voltage 12V DC Normal AMPS 8.0 Maximum Internal Bypass 105-110 PSI Max. (7.2-7.5 BARS) Maximum Submersion 100 Feet Maximum (30 Meters) Maximum Lift 230 Feet Maximum (70 Meters) Outlet Port 1/2" (12.7mm) Barbed Fitting Inlet 50 Mesh Stainless Steel Screen Materials High Strength Engineered Plastics, Stainless Steel Fasteners Typical Applications Potable Water Well Pump TECHNICAL DATA DIMENSION DRAWING OF SUBMERSIBLE WATER PUMP FLOW CHART OF THE SOLAR PUMP Sample order is very welcome to have a test, if need more technical specification, pls send email to us !